Selahattin Demirtas of the pro-Kurdish People's Democratic Party (HDP) speaks at a news conference at Ozgur radio station in Istanbul, Turkey, Oct. 30, 2015. As Turkey prepares for parliamentary elections Sunday, the leader of the opposition HDP party contends the government is blocking its candidates from campaign appearances on Turkish media. 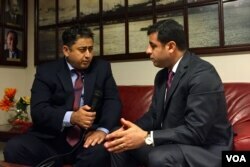 That’s just one of the charges Selahattin Demirtas made in an exclusive interview Thursday with VOA’s Kurdish service. The HDP leader also discussed the government’s branding of some Kurdish groups as terrorist and said the government is more concerned with fighting groups in Syria that oppose the Islamic State rather than battling the extremist militant group itself. "The government is not bothered by the presence of ISIS in Syria," Demirtas said, using an acronym for the group. President Racep Tayyip Erdogan called for Sunday’s vote after his ruling Justice and Development Party, or AKP, fell short of an outright majority in June 7 elections and after talks to forge a coalition government failed. The pro-Kurdish HDP won 13 percent of the vote, surpassing the 10 percent threshold that the country’s political parties must exceed to win seats in parliament. Erdogan hopes to gain enough AKP seats so the 550-member parliament will amend the constitution and grant more powers to the presidency. As The Guardian explains, the measure would require 367 votes, but only 330 are needed to call a referendum. Demirtas said that after the June elections, his party faced "heavy oppression." "Restrictions placed on media coverage of our campaign and arrests can all be said to be special measures implemented to ensure that our party would not win a successful share of the vote," Demirtas said, noting pressure increased after the October 10 bombing of an Ankara peace rally killed at least 95 people. Government forces "have tried to prevent the HDP from passing the electoral threshold and have sought to ensure that the AKP is able to single-handedly form a government and take power on its own," the leader said. However, "we have done all we can to, on the one hand, maintain and spread hope of reaching a peaceful solution and, on the other hand, to stop the war that the government has initiated with the PKK [the outlawed Kurdistan Workers’ party, a nationalist group]," Demirtas said. "We have also done our best to defuse societal tensions, and have acted very conscientiously to prevent Turkey from descending into civil war." He predicted that, despite government impediments, "our share of the votes in this election will be greater than 13 percent." Press freedom has been under fire in Turkey, creating difficulties for opposition voices – especially ahead of the crucial elections. AKP supporters protested outside the offices of the Hurriyet newspaper last month after it published an article they said distorted Erdogan’s image. One of the newspaper’s columnists was attacked days later. Representatives of the Press Institute and the Index on Censorship have tried to investigate the incidents. Demirtas complained of "the storming of press offices by the police, the beating and arrest of journalists occurred so blatantly. These are very sad and unfortunate events. "However, the media has been faced with great threats intended to prevent our party from appearing on broadcasts and press interviews," he said, noting that when one of his party’s candidates "makes a media appearance, the government immediately calls and threatens the boss of the particular agency. They tell them to absolutely avoid broadcasting us." The HDP has 550 candidates, Demirtas said, but "very few opportunities" to participate in television programing. "We may not be able to achieve as great a success as we envisioned because of these restrictions." In response, Demirtas said his party is relying even more heavily on social media. The Turkish government should cooperate with Kurdish fighters to combat Islamic State militants, says Selahattin Demirtas of the pro-Kurdish People’s Democratic Party (HDP). Is Islamic State a target? The HDP leader also said that while "it is in Turkey’s interest to eliminate" the Islamic State militants, he believes the Erdogan government is pursuing an "incorrect policy." He accused it of targeting opposition groups, particularly the PKK, but essentially tolerating the Islamic State. "It even abstained from wholeheartedly supporting the international coalition on the issue of fighting against ISIS," Demirtas said of the government. "Yet, as soon as ISIS was cleansed from certain areas – and Kurds, Arabs, Sunnis, Shias and everyone else who lived in such areas formed cantons – Turkey appeared to be irritated. "Those who seemed not to be irritated by ISIS at all declared the PYD a 'terrorist' organization. They began to discuss the use of all measures against the PYD, including military intervention," Demirtas said. "The Jarablus region, close to the border with Turkey, is also currently under the control of ISIS, but neither Prime Minister [Ahmet] Davutoglu nor President Erdogan have made a single threat toward ISIS. They have not even bothered to criticize ISIS. "Now, the PYD – together with local forces in the region and the support of the international coalition – is preparing to make a move on Jarablus. It is preparing a military operation and is trying to cleanse ISIS from that region. Davutoglu is displeased with this and has openly stated that they cannot cross over to the Western bank of the Euphrates. He has made threats…. This is a very deplorable policy." 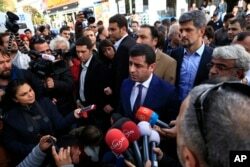 Demirtas said DHP members "believe that Turkey and the Kurds need to establish good relations with each other. This is because the PYD and the Kurds in the region are constantly making peaceful overtures…. "Turkey’s perception of them as terrorists and threats was very wrong," he continued. U.S.-led coalition forces "have stated that they will make agreements with local resistance fighters, and especially the Kurds, to free the region from ISIS. This is the correct approach." This interview was conducted by the Kurdish service.